The Norwescon Art Show consistently highlights some of the best in fantasy and science-fiction themed artwork of all types. Featuring work by our Artist Guest of Honor plus many regional artists, we delight in bringing the best possible artwork to you. The Norwescon art show staff are excited to announce Lee Moyer as Norwescon 36′s Artist Guest of Honor. His award winning work will be the highlighted feature of this year’s Art Show. Along with our other great artists we are excitedly looking for new participants to bring to the art show. We would also like to congratulate Leanne Dunn for receiving this year’s NWC Raising Artist Scholarship to be applied to her education at the Northwest College of Art. 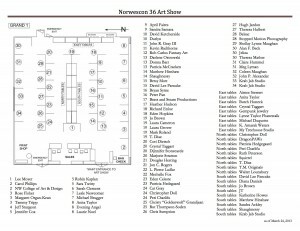 Following is a list of artists exhibiting at Norwescon 36. The art show is looking for more great volunteers. Become part of the team who make the art show fun and successful. If you are interested in joining us please contact our volunteer department through the contact page. We would love to hear from you. The Norwescon Art Show Managers are Doug and Pat Booze. Questions or comments? Contact us through the [contact page]. Register for the full Norwescon 37 weekend (April 17-20, 2014) for just $50 until Aug. 31st—after that day, the preregistration price will increase! Plus, check out all the benefits you get for registering!